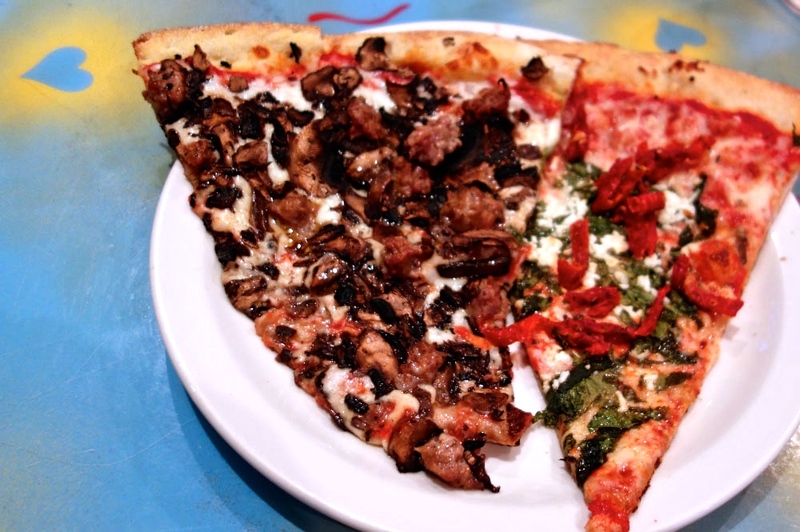 Home > San Francisco Travel Tips > Best Late-night Food Spots in S.F. It’s always a given. Late-night restaurants to feed your hunger pangs (or to soak up the alcohol after a night out) are mandatory for any full-service holiday in the world. But oddly, in the city of San Francisco, the famous late-night eateries are tough to find compared to other major U.S. cities. But it doesn’t mean you need to go to sleep in the city hungry. 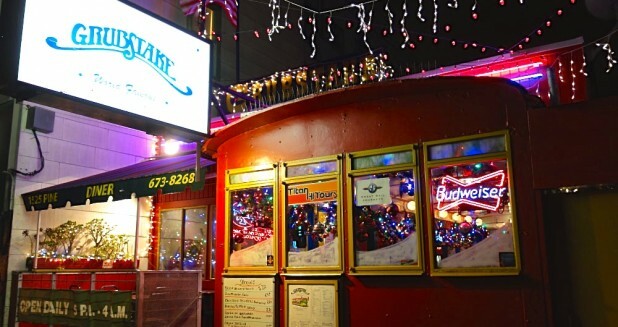 Instead, here you can search out the best late-night food spots in S.F. and stuff your face to leave your stomach—and hangover—happy in the a.m. Located on Polk Street, a more local area of S.F. for nightlife, Grubstake is a blend of a Portuguese and American diner. You can walk in and grab a seat, choose whichever gut-busting meal you want and grub down. The restaurant offers breakfast all night long, a good selection of burgers and, of course, some Portuguese-inspired meals to stay true to its European roots. Most of the meals are too big to handle, so most likely you’ll leave Grubstake in a food coma. For Polk Street late-night food, Grubstake is king. 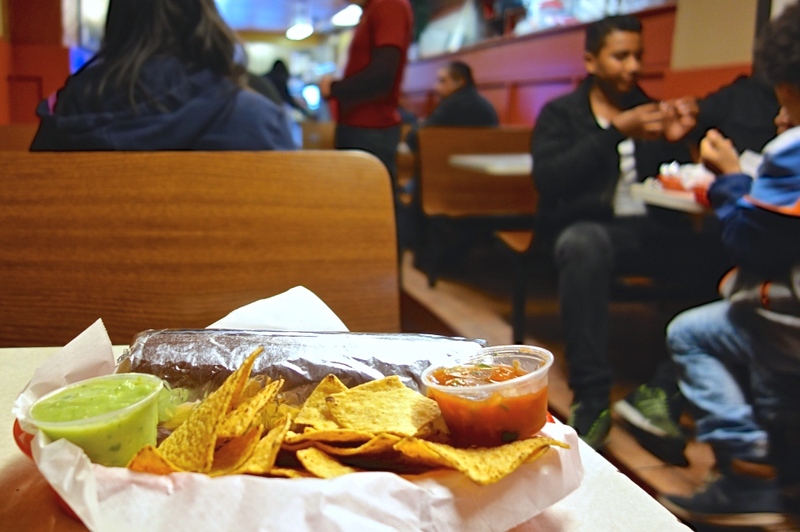 Located deep in the Mission District near the corner of 24th and Mission St., El Farolito is the spot for late-night burritos in S.F., especially after bars such as El Rio. No other place compares for Mexican food at 2 a.m., and the prices are low enough for a full chow session (a meal for around $10). If you want a full Mexican experience, don’t fret either. A complete Mexican menu is available for easy drunk-food consumption. El Farolito is open until 2:30 a.m. during the week and 3:30 a.m. on the weekends. Pizza Orgasmica is the late-night food establishment of The Marina. Closing at 2 a.m. on weekends, with a second eatery open on Fridays and Saturdays for more slice power, Pizza Orgasmica is the spot for a New York-style wedge of pie. Serving healthy slices of dough such as chicken, tomato, spinach and feta cheese slices, along with signature vegetarian pizza, including the Garden of Eden, Pizza Orgasmica is a good spot for a foodie, even a drunk one. The place is 10 out of 10 for people watching too. So grab a slice for around $4.50 (without tip) and enjoy the pizza mayhem. 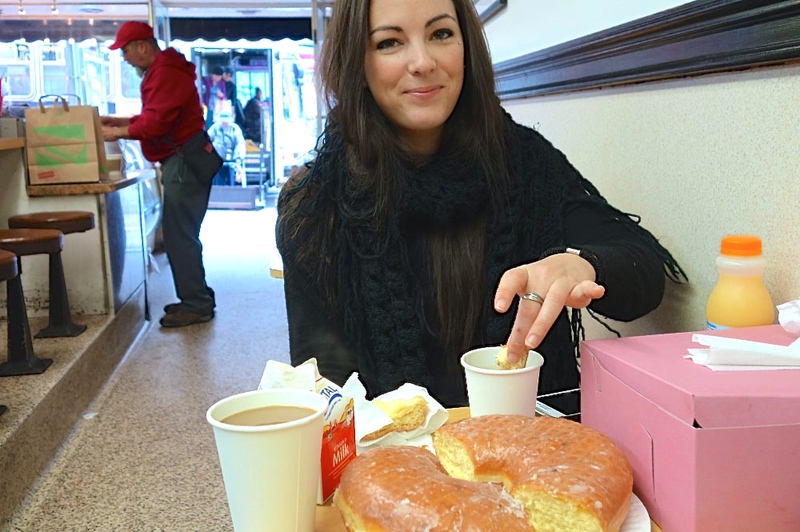 Bob’s Donuts is the best of the 24-hour dining spots in S.F. Although technically more of a sweet-tooth location (with not much of a savory choice of food), Bob’s has been a staple of Polk Street since the 1950s. The prices are cheap and the donuts, such as the Apple Fritter or Big Donut (the size of a Big Wheel) are a taste to send you to your happy place. The line starts around midnight, but the donut/coffee shop is open 24-7, so there’s no rush to hop in line. Bob’s is always reliable, and the high cholesterol is worth the bites, especially at 5 a.m. and after a few beers. The place where it’s “hip to be square,” because of its square-cut pieces of pie, Golden Boy Pizza is the unofficial winner for North Beach late-night food. 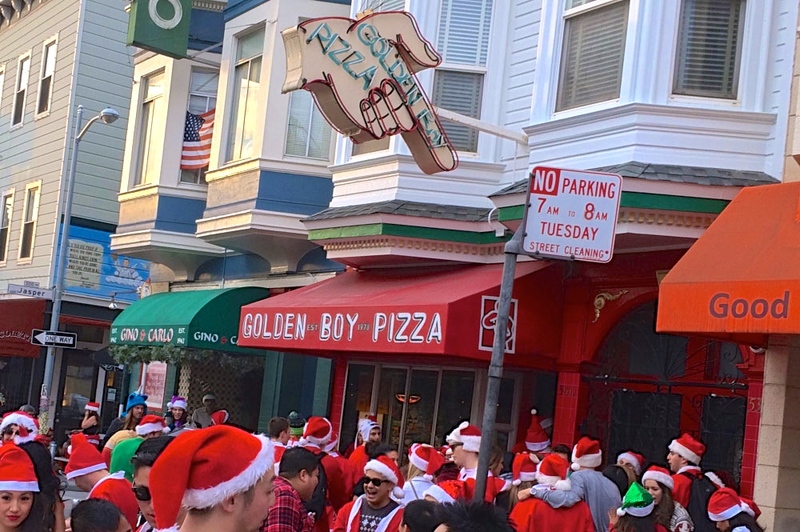 Located just off the intersection of Grant and Green — and in the same location as 5+ bars — Golden Boy Pizza is found under a giant neon finger. And more often than not, especially on a weekend, the line is out the door. Each slice is $4, and they have a selection of unique pieces of pizza not found elsewhere for late night (clam and garlic pizza, anyone?). The feel of Golden Boy Pizza is grungy, yet welcoming. It’s open until 2:30 a.m. on the weekends. Union Square is a tough spot for late-night food. The diners are typically overpriced and under deliver. But Bite, a New York-style hoagie shop just a few blocks west of Union Square, is perfect to fulfill a late-night craving. The selection of meals such as The Kitchen Sink, a submarine with seven meats on it, or individual pickles the size of a rolled-up T-shirt, is great for a late-night feed. And the gourmet selection of breads, meats and cheeses, especially at 2 a.m. every night of the week, is far above par compared to the other late-night restaurants in Union Square. Oddly, though, not many people know about Bite. Now you do! 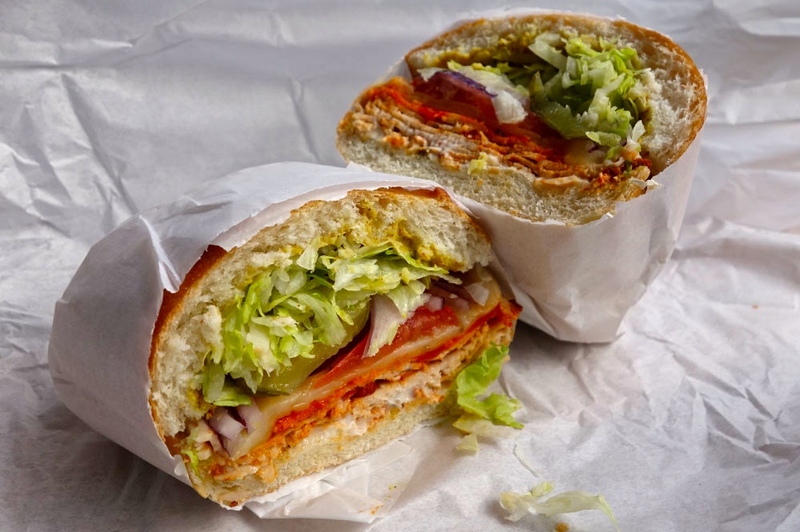 Best Late-night Food Locations in S.F. And there you have it—the best late-night cuisine options for a traveler in S.F. Of course, there are more spots in the city for late-night eats, but these are legendary — the all-stars mentioned by locals when asked. And if late-night food is desired, especially after a night on the drink, why not go try some new spots? We hope we helped narrow down your late-night food search. Tommy’s Joynt (near Polk Street) – Open until 1:40 a.m.